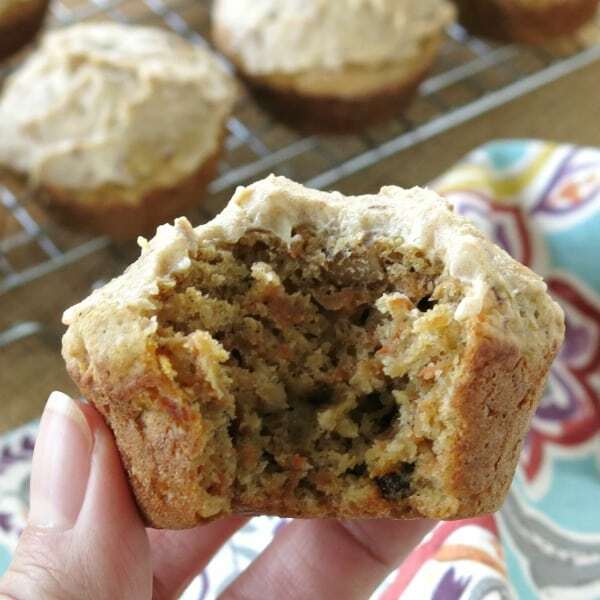 Even though these Healthy Carrot Cake Muffins with Cream Cheese Frosting have NO sugar, use whole wheat flour and Greek yogurt, they are moist, delicious and will satisfy your craving for homemade carrot cake. Get ready to break into a happy dance! I’ve been tirelessly creating a Healthy Carrot Cake Muffin recipe complete with cream cheese frosting that will satisfy even the pickiest dessert aficionado. Your welcome! 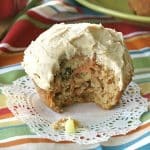 In my humble opinion, these carrot cake muffins are actually good for you! Enjoy one (or two) for breakfast, a snack or dessert…they’re perfect for a toddler or a lunchbox too. While you have all the ingredients out, make some no-bake Carrot Cake Balls too since they share many of the same ingredients! If you’re one of our die-hard zucchini fans, then you’ll recognize the similarities to our Healthy Zucchini Muffins. It was a natural evolution. Shredded carrot – use a hand grater or a food processor to shred several carrots. We used 3 but the amount depends upon the size. Lightly press the shreds with a paper toerl to remove excess wetness, if necessary. However, you don’t need to go crazy as you do for Chocolate Zucchini Muffins or Cauliflower Pizza Bites! Crushed pineapple – drained. Save the liquid for another purpose. Date paste – Sounds complicated but it’s very easy to make. Follow this tutorial on how to make date paste. Whole wheat pastry flour – unbleached all-purpose flour or a combination if 1/2 whole wheat flour and all-purpose flour may be used. We like the delicate texture of pastry flour in this recipe. Greek yogurt – we used a non-fat variety. Raisins – dark or golden raisins. Walnuts – finely chopped; Pecans are also nice. Or, leave this ingredient out for a nut-free version. 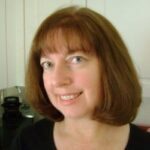 Cream Cheese frosting – the ingredients are cream cheese, date paste, and vanilla extract. 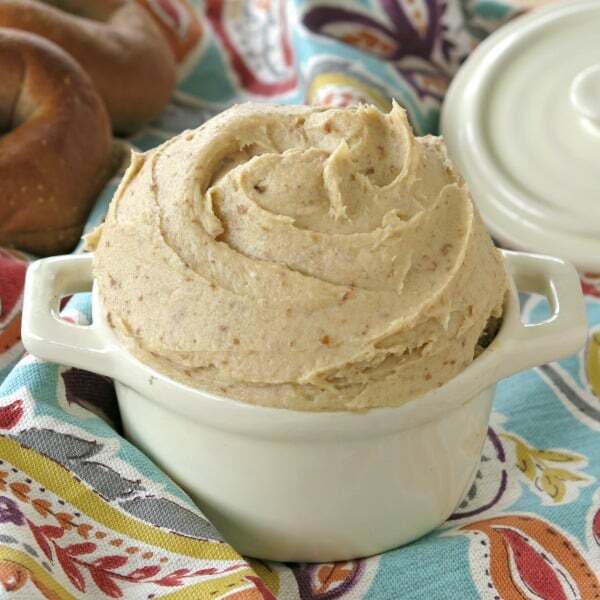 Check out Healthy Cream Cheese Frosting with Date Paste for more details on this AMAZING topping that’s useful in so many recipes. And, if you’re looking for a traditional frosting, check out this Cream Cheese Frosting for Carrot Cake by Cupcake Project. There’s a little work involved to make homemade Carrot Cake Muffins, such as shredding carrot and chopping walnuts. So, we suggest making up several batches while you have all of the ingredients out to prep. For the very best results, we suggest storing muffins unfrosted and keeping a jar of frosting in the refrigerator to use as needed. 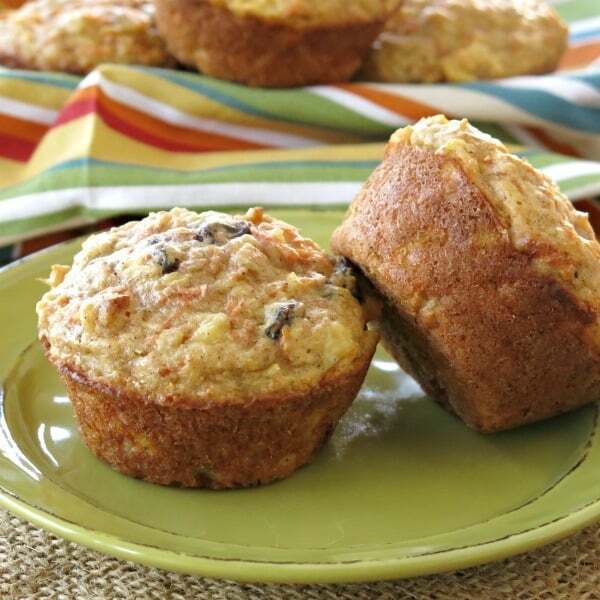 Store unfrosted muffins you will use in the next 3-4 days in an airtight container on the countertop. For best results, line the container with a paper towel and arrange the muffins on top in a single layer. Place another paper towel on top. The paper towel will absorb excess moisture as the muffins settle so you won’t end up with a soggy baked good. Store frosting in the refrigerator and top muffins just before serving. If muffins are frosted, then store them in the refrigerator just to be safe. 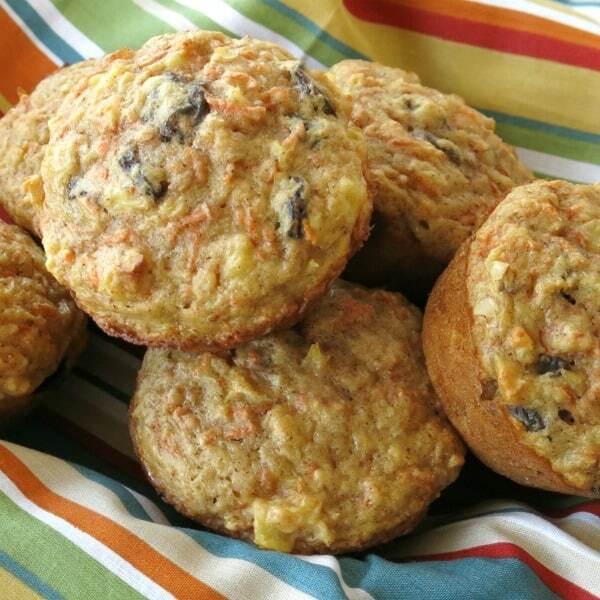 If you have lots and lots of Healthy Carrot Cake Muffins, then store some in the freezer. Allow the muffin to cool completely and then individually wrap each one in plastic wrap and store them in a large plastic bag or container. When you’re ready to enjoy one, lift it out, remove the plastic wrap and let it come to room temperature. Or, microwave it for about 15 seconds to immediately defrost. Frosted muffins can be stored in the freezer. Give the frosting ample room to harden in the freezer before wrapping it in plastic wrap. 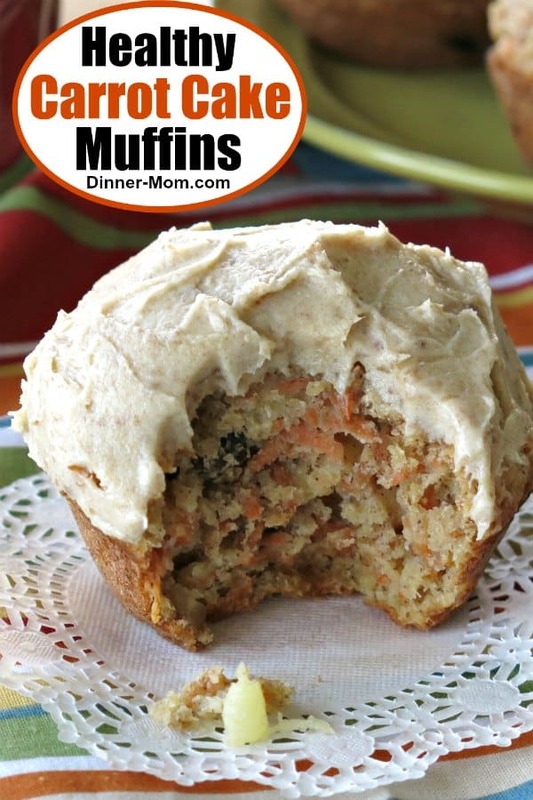 Please rate these Healthy Carrot Cake Muffins and tag @DinnerMom or #DinnerMom on social media. We love to see what you are cooking up! Shred carrots using the large holes of a grater or a food processor. Spread carrot shreds out on a towel and top with another towel. Gently press down to remove excess liquid. Measure out 2 cups of shreds and set aside. Combine flour, baking powder, baking soda, salt and cinnamon in a bowl. Stir egg, yogurt and date paste into the dry mix. The batter will be stiff. Add drained pineapple and carrot shreds to the bowl and stir to combine. Frost with Cream Cheese Frosting if using. Carrot cake is my weakness and I’m so glad I found your recipe!! These muffins were moist and delicious and I love the portion control. So glad to have a batch in my freezer!!! My husband is a big fan of carrot cake! I’m making this to surprise him. Thanks for the great recipe. Can you omit the pineapple? Recipe looks awesome. To be honest, I’m not sure! It definitely needs something to help thin out the batter so I think you would need to replace it with another wet ingredient like maybe banana. Love to know how it turns out!